Economist Sudha Shenoy decided to rectify the problem. As a Hayek scholar, she noted that Hayek had in fact addressed Keynesian policy in scattered places throughout 40 years of writing. She decided to select the most poignant passages. She linked them all together with marvelous commentary and analysis. And voila! 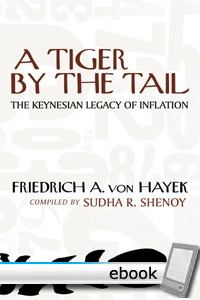 Here is the book on Keynesian economics that Hayek never wrote. It first came out in 1972, to wide acclaim. The Hayek parts are fantastic, of course. The surprise is the expert editing job by Professor Shenoy, which adds enormous value. In 192 pages, the book ended up being a total demolition by Hayek of the most baneful influence on economic science in the 20th century. It was published by the Institute of Economic Affairs but fell out of print. The Mises Institute cooperated with IEA to completely reset the book and publish it anew. It adds something even more wonderful: a massive introduction by monetary theorist Joseph T. Salerno. In total, then, this is a priceless collection, one that will enlighten and save you from hopping up and down to your bookshelf. It strikes you as you read what a brilliant mind Hayek had, how tough minded he really was, and just how off base is Keynesian theory. You can get the metaphor from the title. What Keynesianism unleashes is wicked inflation that no one can control. This might be the essential guide to our future. Introduction to the Third Edition by Joseph T. Salerno. Is There a Price ‘Level’? 12. F.D. Graham’s Criticism of Keynes. VII. The Outlook for the 1970s: Open or Repressed Inflation? Why the Slump in Capital Goods Industries?